There is a small spot in Cebu City that I didn’t give much attention during my past visits. That spot, fronting the Cebu Cathedral Museum, finally caught my eyes when I saw a statue of Pintado. I wondered why a precious space would be given up for this statue. I realized, upon closer inspection, that that statue is Rajah Humabon, the king of Cebu when the Portuguese explorer, Ferdinand Magellan, “discovered” the Philippines for Spain. Rajah Humabon, also known as Hamabar, is the king (rajah) of the kingdom of Singhapala (now part of Cebu City). He is the son of Sri Bantug and the grandson of Sri Lumay, who came from Sumatra (now part of Indonesia). Thus, we can say that the Cebuanos today are directly related with the Sumatrans. A marker, located a short distance from Rajah Humabon’s statue, contains inscription of a brief historical accounts about Rajah Humabon. Rajah Humabon was the first Filipino chieftain to embrace Christianity, regarded as the as the wisest and bravest man in the island. When Ferdinand Magellan landed on Cebu on Sunday, April 7, 1521, Rajah Humabon made a blood compact with Magellan as a symbol of their newfound friendship. Captivated by its noble teachings, Rajah Humabon was converted to Christianity. On Sunday morning, April 14, 1521, Humabon and his wife Humamal, and about 800 Cebuanos were baptized. Humabon was given the name Carlos in honor of King Charles V of Spain and his wife Queen Juana after King Charles' mother. In remembrance of the occasion, Magellan gave Queen Juana an image of the Child Jesus as a gift, while a large cross was erected to mark the baptismal site. The image of the Child Jesus that Queen Juana received is the same image of Santo Niño that is enshrined in the Minor Basilica of Santo Niño and is deeply revered by all Cebuanos. Meanwhile, the large cross is the Magellan’s Cross that is on display near the Minor Basilica. The inscription didn’t mention the third gift that Magellan gave to Rajah Humabon. That gift is the Ecce Homo is the Latin for “Behold the Man”, which Pontius Pilate said when he presented the scourged Jesus Christ to the crowd. Painting of the Santo Niño. Notice his staff pointing at Cebu. The inscription said Rajah Humabon was captivated by the noble teachings of Christianity. I do not believe this. What I believe is that Humabon had practical reasons he made a blood compact with Magellan and why he converted to Christianity. One reason is the miraculous healing of Rajah Humabon’s uncle. Antonio Pigafetta did elaborate on the procedures done by the Spaniards but folklore says that the Santo Niño is the one who healed Humabon’s uncle. A more practical reason is the chieftain of Mactan, who is now popularly known as Lapu-Lapu. I read in Eye in the Sky’s blog that Lapulapu Dimantag came to Cebu from Borneo and asked Rajah Humabon for lands. Humabon gave the region Mandawili (now called as Mandaue) and the Island of Opong (now Opon) in the hope that Lapulapu’s tribe will cultivate it. Unfortunately, Lapu-Lapu turned to piracy and attacked merchant vessels calling at Cebu which affected trade in Cebu. I guess that Rajah Humabon was impressed with the European’s guns, cannons, and big ships. That's why he asked Magellan to kill Lapu-Lapu for him. 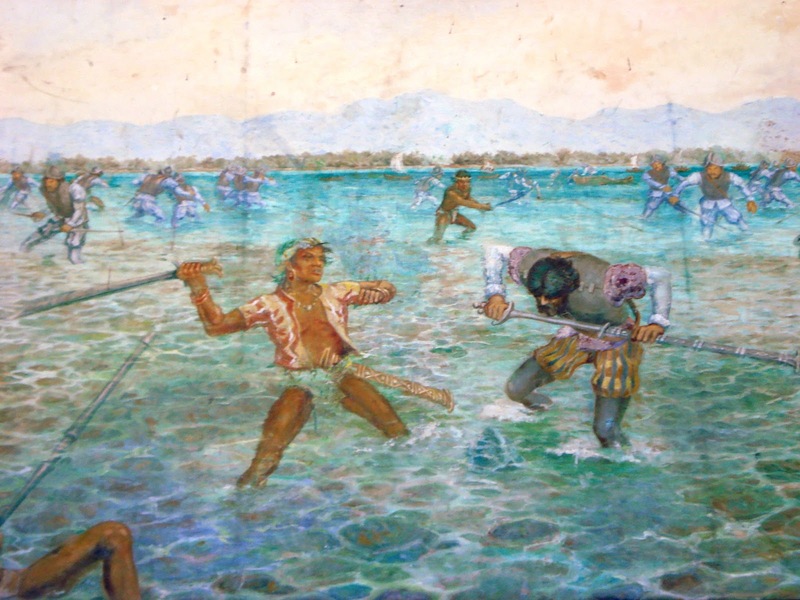 The Battle of Mactan against Lapu-Lapu resulted in the loss for the Spaniards and the death of Magellan. The newfound friendship turned sour as Rajah Humabon tried to massacre the remaining Spaniards during a feast. Some say that Humabon did this to avenge the Cebuanas who were raped by the Spaniards. I believe, however, that this is a way for Humabon to show to Lapu-Lapu that he is no longer allied with the Spaniards and thus avoiding further conflict. The Europeans who survived left Cebu and continued their journey back to Spain, thus circumnavigating the world for the first time. Interesting piece of history there. Interesting history. Have a beautiful day! I'll be going to Cebu this December! Woohoo! I'm excited. Like i always wonder what to do in Cebu and here it goes! Thanks Ish! Nice post about Rajah Humabon. :) Sorry about the severely delayed reply. Haven't been actively blogging... though I will try this year. No need to apologize. :-) Thank you for your blog post. I got some info about Rajah Humabon from your blog.